Marisa Silver is one of California’s most celebrated contemporary writers…(whose) best stories are prickly and nimble, satisfyingly acute… so good it might give you vertigo. The stories in Alone With You are portraits of everyday sorrows, but Silver keeps hope alive, even when it’s on life support. Her characters often feel powerless, then discover what they can do….Silver makes clear with devastating simplicity, that tendency to change course works to our advantage…If we can adapt, forge new ground on which to stand, we survive….Silver understands this truth and passes it along to her characters with grace and insight as they grapple with change, revelation and the complexities of modern life. These are clear-eyed, unsentimental stories that resound with resilience. Unwellness is woven through these eight beautiful and brutal stories from Silver (The God of War), who gives readers finely wrought slivers of lives…and the intermingling of hope and despair…Silver infuses her characters with a fatalistic resilience that’s revealed through tiny, perfect details. …these moments of bleak epiphany and emotional purgatory showcase [Silver’s] strengths as a writer. Marisa Silver’s Alone With You is a triumph for the short story. Funny and surprising and unsentimental, the collection finds in dark situations a persuasive hope. Every story is striking both in its emotional complexity, and in the wry clarity with which it’s told. Alone With You is heartbreakingly honest, and thus lends itself to reading in multiple sittings. It is her unsentimental style, however, coupled with her fresh language, that makes the collection so profound. The intricacies of these short stories are so masterfully weaved together that they form a seamless tapestry reflecting raw slivers of contemporary Americana. Alone With You is as satisfying as the perfect meal. Alone With You: Stories is one of the most compelling and honest portrayals of human nature written by a (relatively) new author that I have read in a long time. Emotions are treated like the multidimensional and exquisitely complex things they are rather than the boiled down version we are often treated to in contemporary literature. The intricacies of these short stories are so masterfully weaved together that they form a seamless tapestry reflecting raw slivers of contemporary Americana. The harshness of some of the stories is blunted by the skill with which Marisa Silver presents them to the reader. Silver tells eight quietly haunting tales about love, memory and making ends meet. What makes Marisa Silver’s portraits of contemporary American life so powerful is her unblinking gaze, her willingness to look imminent disaster straight in the eye. And what makes her characters unforgettable is the combination of bewilderment and resilience with which they navigate this precarious life. Alone With You is a beautiful collection: urgent, clear-sighted, wide-ranging, profound. The blending of her talents makes for accomplished narrative, delicate but sure, held together by expertly constructed point of view. Tender in her seriousness, refined yet absolutely contemporary and stylish, Marisa Silver is doing something balanced and minutely considered, something very nearly seamless. Marisa Silver’s stunning new collection Alone With You, a title that holds both the possibility of shared-breath intimacy as well as the most profound kind of loneliness, a subtle foreshadowing of what lies beneath the cover. This reading is not light emotional fare and while her stories are riveting, they deserve slow and concentrated dedication. …a polished, incisive collection…Each of these eight stories drives unflinchingly toward a moment of unexpected and inevitable clarity about the precariousness of the world and the resilience it requires. Short stories to be savored, these are recommended for a wide range of readers…[a] moving collection. A collection of eight stories, all brutally honest, gripping and profound, Alone With You by Marisa Silver brings snapshots of damaged ordinary life to the reader with almost effortless grace. Whether you choose Alone With You or another of her short story collections, pick one up immediately. Alone With You is a stunning collection of eight short stories that will haunt the reader long after the last page. Longing swells each of the eight stories in Alone With You, as Silver investigates ‘aloneness’ and the dear and inevitable distance between people in loving relationships. These stories stand out because of their high tolerance for complexity, never opting for a single note. The situations here don’t settle on the neat broad themes of loss or connection, but there are always surprises, nuances, changes of heart. The wide range of settings and characters in these eight stories attests to Marisa Silver’s prodigious imagination…Her style is breezy…its clever snap can be captivating…and Silver’s observations can be spot-on. That our lives unfold before us with a chilling ambiguity and no particular regard for our preferences is the truth that Silver reveals. She does so with a sympathy and affection so wide and deep that when we’ve finished the book, we want more. 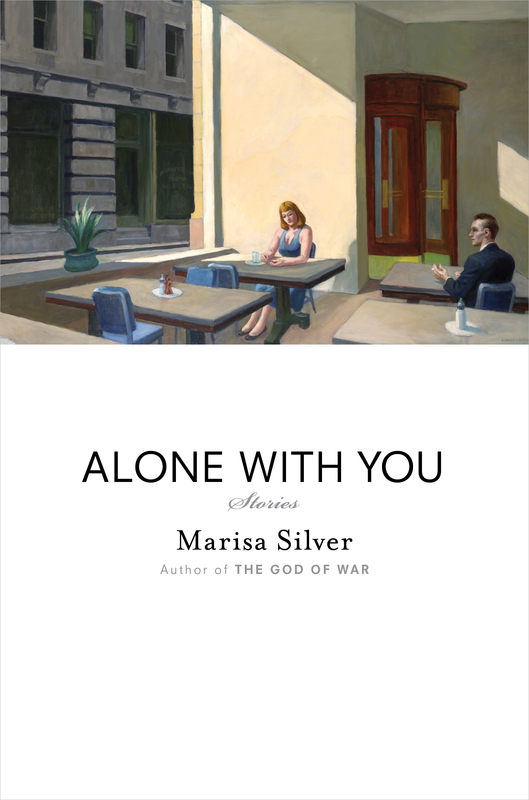 [In] Alone With You, Marisa Silver explores the impact of collateral damage, whether sustained in war or life…Silver’s characters manage somehow to emerge as credible realists, unafraid of the rigors of making do. Even in the darkest moments, their stories are illuminating as they find the courage to face who they are…fierce…brisk and keenly observed. Alone With You offers eight extraordinary portraits of life’s tender humiliations as well as its sharp, rude jolts. Marisa Silver’s virtuosic range seems endless, and yet her ear and heart are in each case mining for a precise kind of undoing: when the fog suddenly lifts and people manage stark contact with themselves, if only for a fleeting moment. These moments are brought to bear with deftness, compassion, and an eerie, unflinching grace. Her new collection (eight stories, three first published in The New Yorker) showcases her uncanny ability to tap into the unsettled nature of our times. Alone With You is a jewel. Actually a cache of many gems, each one complete and powerful in both the feelings that they evoke and the eloquent way in which they unfold. A stunning collection, sad in all the best, thinking ways.